The fact that you’ve landed on this page of my web site would suggest that you, or someone you know, has got a black or blackening toenail. Don’t worry. I am here to help you with all the information you need. First off, it might not be fungus – but let’s take a look at things in more detail. There are a few things that might cause your toenail to become black (or blue, purple, brown – generally dark colors). An injury – Bruising or a collection of blood under the toenail can cause the nail to appear dark with black, blue and purple shades of color. Often called ‘Runner’s toe’ it’s caused by an injury or trauma to the toe. Cancer – A scary thought but it is a very rare condition. Cancer occurring in the nail bed and the surrounding area will show up as dark, tan and or black spots underneath your toenails or fingernails. Dark Skin – If you have dark skin (African American or black people) it is not uncommon to have tan or dark lines running down your fingernails or toenails. Thought the possibility for cancer should not be ignored. Fungus – A fungal nail infection can cause discoloration of fingernails and toenails. Toenail fungus can cause the nail to appear dark even black. Often though there will be other shades of yellow and green associated with fungus. Sometimes a nail injury can be a memorable event. Something like jamming your finger in a car door accidentally. It hurts a lot so you can remember it. Or you drop something heavy on your toe accidentally. This can cause a blood blister of sorts to form under the nail. This will turn the nail bed a dark shade of black, red and purple. It will likely be painful and you might eventually lose the entire toenail or fingernail. Though sometimes a black toenail can be caused by an injury over a period of time, not in a single traumatic event. Running or playing sport can put pressure on toes and toenails. Especially with shoes that might be a bit too tight or too loose, that then cause your toes to rub. Eventually the rubbing and pressure can lead to bleeding under the nail and in the nail bed. Injured nails are more susceptible to infection. Make sure you keep them clean and dry. At the first sign of puss or fungal infection, you should treat it with an anti-bacterial or anti-fungal treatment. If it doesn’t improve, see your local doctor. Note: Cancer under the nails can only be correctly diagnosed by a biopsy. If you have any concerns, please see your doctor. The famous reggae musician Bob Marley died of nail cancer. The cancer begins in the nail bed and can be misdiagnosed as other nail problems. The presence of cancer in the nail matrix (nail growth area) can discolor new nail growth. Think of a piece of paper being dragged across a black paintbrush. As the nail (paper) grows, the cancer (paint brush) colors a black line. As the cancer grows, the line can thicken. If you have a family history of skin cancer or you have any of the symptoms mentioned, go see your doctor immediately. Get a biopsy done on the black nail to be safe and sure. The most likely disease that occurs in toenails is a fungus infection. As the fungus attacks the nail and nail bed, the toenail discolors to darker shades. In response, the toenail begins to thicken and become brittle. Eventually the nail will be lost entirely. Injuries to toenails can increase the risk of getting a fungal infection. In some what of a vicious circle, toenails that are weakened by fungus and are easier to injure and damage. What to do if you have a black nail from injury? In most cases toenail and fingernail injuries will heal by themselves. Keep the injured nail clean and dry to prevent any infections. However, if the nail is painful with a lot of pressure under the nail from bleeding, medical treatment might be required. Book an appointment with your doctor. Your doctor might recommend removal of the nail or a small hole might be made in the nail to reduce pressure and blood build up. What to do if you have black nail from cancer? What do if you have black nails from fungus? If you have a fungal nail infection you should start treatment right away. The longer you wait, the longer the fungus has to take root and will go deeper. Once fungus gets to the nail bed it is very difficult to get rid of. There are many types of treatments available – oral medications, laser treatments and topical ointments or creams. Each has their upsides and down sides though generally it’s easiest and cheapest to start with a topical treatment. You can read more about fungus and treatments on the front page of my blog. Combine treatment with good foot and toe hygiene. Wash your toes well and make sure you dry them properly. A good treatment with a product like ClearNail Pro+ combined with good hygiene will have your nails looking like new. Stick with the treatment and you’ll see good results and stop the fungus in it’s tracks. 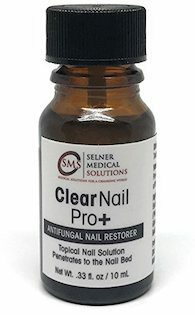 Get rid of nail fungus now – click here to learn more about ClearNail Pro+ and buy online. My toenail became black/purple and it eventually fell off. Now, the nail has regrown but the skin in front of the nail has became black/purple. Any idea what it could be? That sounds like there could possibly be blood and/or bruising under the skin, especially if your toenail became black/purple after it had some kind of injury. However, it is always best to speak to your doctor and get them to take a look at any unusual spots or coloration on your skin. About 2 months ago I hurt my big toe nail playing sports (It hooked to the inside of my trainers and lifted up) Soon it started to darken and became almost purple. I covered it with nail polish for a while until yesterday I noticed that it has become yellow (Like when a bruise becomes an off shade of yellow) and has lifted half way, i had to clean most of what was inside as it was a bit dirty and had an odor. There is a bit left still on the skin so i don’t want to take it off and the bottom of my toe feels very soft towards the skin. It doesn’t hurt but its pretty uncomfortable. Is this normal and okay? Will it eventually come off? Hi there, I’d recommend visiting a doctor and getting them to investigate your nail injury further. The exact same thing happened to me in the left hand in the middle finger. It was purple, then, green and then yellow and then had an odour. I didn’t do anything, just cut the nail and keep the nail bed clean. It will eventually grow and normalise. I noticed a few weeks ago that I had some black on my right big toenail but thought nothing of it as I had worn tights recently that were rubbing against my toes at the front of my shoe. I have just taken my nail polish off and realised it is much worse than originally thought and my right toenail is around 75% black. I also realised that on my left big toe nail there is a small rectangular shape of black as well. Neither of my big toes are painful in anyway and there is no yellow, purple etc colour surrounding my toe. Please can you help me as I’m slightly worried as to what this may be. Thanks. It may be caused by blood under the nail as a result of an injury from wearing tight shoes, however if you are concerned as to what it may be, I would suggest booking an appointment with your family doctor. Hi My toe nails have been black for almost five months and have some sort of thickening under the toe nail. Can you please advice me what to do. It looks like it is getting worse. Thank you. Please go see your doctor. I have a little gray/black spot Under my toenail, no injury has occurred. I’m very concerned. What do you suggest it is? It’s very hard to diagnose something like this using a short description in words. If you’re concerned, you should see your doctor. my toe nails are black but not completely black it is cause due to my shoe they are to tight,and i never went to see doctor,will it recover by its own? or it is a must to see doctor? It may grow out on its own if its just a case of bleeding under the nail caused by tight shoes, however if you are concerned, you should see a doctor. My toenail has been blackened And thick for over 2 years. I didn’t think anything was wrong at first, but its gotten a lot worse now. It is very itchy all the time and it peels. How do I get rid of this? Should I see a doctor or can I do this on my own? You could try using a natural treatment like ClearNail Pro+ and see if it clears it up – otherwise, you should speak to your doctor. Mine has been black for over a year, but mainly on the left. Recently, it moved to the right of the nail a little. It doesn’t ‘hurt’ but I’m very aware of it. My doctor prescribed Terbinafine (Lamisil). It doesn’t resemble the cancer indicator, but I did have melanoma on my back four years ago. at first my second toe had only a black vertical line under the nail. I eventually cut the nail and the line was visible. so I tried to dig out the line because I figured it was a splinter. I couldn’t get it and gave up. since then the nail has thickened and is now turning black from within. the nail is also currently painful when pressure is applied and since i cut the nail today. also my pinkie toe has the visible black thing in my nail now and is turning black. Please go see a doctor and have them diagnose what is wrong. Did you ever go to the doctor for this?!? If so what is it? I have the same exact thing it comes and goes. Hey Emily, I’d strongly advise contacting your doctor and having him look at your nails. I’ve had a blackened little toenail for about 8 months now. Reading the above comments I now believe it may very well be due to rubbing from shoes. Could anyone give me a rough idea at how long I could be looking at for it to clear up and what treatments would work best? My partner and I don’t believe it to be a fungal nail infection. If it’s just caused by rubbing against tight shoes, then it should clear up as the nail grows out. Toenails tend to grow slowly, and it may take 12-18 months for it to fully grow out. Bob Marley did not die of nail cancer lol where do you get your info from???? He was shot on stage!!!!! I read about Bob Marley’s death due to nail cancer from Wikipedia. Bob Marley died of cancer which started in his big toe..he refused to have it ampbody. Bob Marley died of cancer which started in his big toe..he refused to have it amputated due to religeous beliefs, eventually the cancer spread through his body. Bob Marley died of Cancer!! not shot on stage!! !where DO YOU get your info from!!?? Bob Marley DID die of cancer, originating on his toe !!! No, I haven’t heard of this – but you’ve definitely chosen the right course of action by choosing to go and consult with the surgeon who performed the operation. Hi, I noticed a dark brown/black spot about a centimeter long on the bottom right side of my right big toe, nail cancer does not run in my family, but I am very worried. It does not hurt, nor smell but my nail is decently thick. I am very concerned, help!? Hey Devon, you should go see your doctor if you’re concerned about the health of your nails. My toenails are not thickening or have any fungus symptoms at all, instead they have developed a blackish greyish surface. It’s similar to some African American nails. My fingernails have not changed, just my toenails. I’m pregnant so maybe it’s hormones or a raise in melatonin? I’m 36 and yes I am partly African American but this is the first time ever it has happened and I have very light fair skin. Is it the pregnancy or an odd beginning of something else? I definitely don’t have foot fungus and I don’t wear dark tinted shoes. If you’re concerned about the change that has occurred to your nail, it’s best to consult with your doctor to confirm that there are no issues. I am very confused because i first started out with what looked like a paronychia toe because it looked like a small infection at the end of the nail and so i was put on antibiotics for like 2 months and never went away. I then was told that it might be an ingrown toenail and so we went to a foot doctor that trimmed around the toenail and told me to soak my feet in warm water with emsalm salt which the other doctor told me to do but it still didnt work and foot doctor also gave me like ear medicine 2 drops a day everyday on my toes and again no change. It did however started bleeding in the warm water and obviously thought it was cool/badass and after that it looked a lot bloodier and worse then before. And so i went for a physical yesterday and mom told me to meet her at the foot doctor because its in the same building and we went right in and so the foot doctor trimmed it once again it it started to bleed and forgot to mention granalation tissue started to come out from the left side of my right toenail (i have infection on both toes btw) and so it started bleeding he wiped it off and he kept poking under the toenail. I freaked out and he said it was definitely gonna fall off and grow back in 2 months after which i think is false cause everyone else says it takes longer on the internet and so he wrapped it in a thing with tape and it was hard to get off today because the tape was hard to get off cause it stuck to the dry blood of my toe and hurt as f*** to get off but saoked in water to get off remaining paper and worked and mom says it looks better but im freaked out if it will hurt to get my toe fallen off on its own. Please help me i have no idea what i have and i need to get rid of it. P.s. My left toe hurts a little bit casue infection is still there but looks great and doctor last time we went said my cubicle i think is called was trimmed off a little bit and that was the cause and last thing i think my foot doctor guy made it much worse than before and i think he made it so that the air is in my toenail and he said most likely to fall off but to me its gonna fall off and srry for the long story i just needed u to read it all and know my story. I wear dark socks constantly, so I thought that the dark spot on my pinkie toe was just fuzz. I was washing my feet in the shower today and noticed the black was underneath the nail. Just a few months ago I got rid of toenail fungus (yellow and brittle toenails) on a few of my other toes, but it wasn’t on/in my pinkie toe. Is this toenail fungus? There is no odor and I’ve always had thick nails. It isn’t brittle, either. Please help. Towards the left of my small toe on my right foot has started to develop a black line going down the nail. For the past few weeks I have been wearing shoes that have given me blisters oops so I don’t know if it’s that or not. I have cut as much from the top as I can but I can’t go any further down. My nail has become a little wobbly and I don’t know what to think of it. How can I sort it out on my own if possible? My toenail came completely off after breaking my big toe and it is growing back black and thick.what could it be? Also had a hit to big toe. Nail turned partially black but hasn’t fallen off (yet). It continues to grow normally, however new nail is growing back black. Is it still drawing blood from the injury which may be under the skin where the nail grows from? No pain. Hi, I work at Chrysler, for the the most part in standing for long periods, and walking a lot! I’ve been there 4 years now and majority of my toenails are black or turning dark on both feet. I didn’t have this problem until a year or so in. I don’t remember having any injuries to my toes! Should I be worried? Hello, first of all my toe nail had a black spot but now it’s tuning white? What should I do? My blackish mottled toenail is only one nail and I’ve had it for years. I always wear nail polish, would this make a difference. Will it grow out if I don’t put on nail polish and let it grow out? It may, but I’d recommend treating it to be sure. I have a blue vertical lineon the very side of my big toe for 3years aproximatly , I went to the skin dr. and he gave me pills to take for 3 months and a nail polish to brush the nails , now reading about it I am worried ,I think he should have done a biopsy I had a becell litlle tumor removed on my eyelash 11years ago ,I told him but he didint seem to be concern , should I go back ? thanyou. If in doubt, definitely go back and get an answer from your doctor. Hi, I’ve started working at a restaurant for about 3 weeks ago. Today I just noticed that there was dark red spot under both of my toe nail bed. I don’t feel pain at all. I don’t know what happen to my nails because I didn’t have any injury. I wish it’s not a symptom of cancer. I am having trouble find information related to the case with my toenail. My right toe is exactly that discolored, but compared to my other toes, it is. I have had this now for more than two and a half years. The nail isn’t growing properly, and neither are my cuticles of the toe, and the toe can be painful at times. Is this something simple, and only because I don’t take care of the toe to heal properly(I ask myself)? Is there an idea as to what this could be, and what are possible solutions with actual results? My toenail isn’t exactly discolored, but neither is it the color of my other toes. It has become a concern because of the time that I have had it, which is more than two and a half years. Isn’t just that I’m not taking care for it to heal, or could it be something else? I could go in depth to explain the case if needed for more specifics. Hi, recently I have discovered a small (about .75 cm) dark tan circle on my big toe. Upon closer inspection it has three smaller black spots in it. The next day I noticed the whole circle had darkened slightly. I don’t remember injuring it and even if I did it seems weird that it is an almost perfect circle, Should I be concerned? I don’t want to go to the doctors unless I really have to. Are there any home tests I can do to see what it is? I’d always recommend visiting the doctor if you’re unsure. So I have have never had any issues with my toes however in my junior year of college I began to see my nail get thiner and when I would go get my toes done I notice I began to feel my nail have a bite of pain I stoped going to get my toes done BC I saw it change to a pail white now 2moths ago I was removing my nail polish and noticed a black spot underneath my nail and started digging it out and actually broke a small hole threw my nail but no pain today while removing my nail polish again my entire nail fell off and the nail underneath is small and the top part is black. I’m scared what should I do? I was told that once the new nail is black that ment that the fungus was dying ( I think I had fungus when it was yellow) I’m freaking out now help! NATURALLY BLACK TOE NAILS !!!!! For as long as I could remember. My toe nails have always been dark. I am a chocolate complexion woman. Every since I was a child, my toenails have been a dark brown color. I’ve always hated them, because all the other kids toenails were clear and white and I had these dark brown/black toe nails. But the one thing I do remember, My mom would take time and paint my toenails in the summer and I was okay with it. She built that confidence in me, Although, when I go to the nail shop, I do still feel some kind of way when they remove my black nail polish. Oh yea, that’s another issue. I CANNOT WEAR LIGHT, WHITE OR BRIGHT COLORS, because the color is never the true color of the bottle of polish, because my nails are so dark. I don’t get the French manicure, because my toenails are so dark, they don’t even look right with a French manicure. I always wear a black, dark purple or navy blue nail polish, so no one can notice that I have dark toenails underneath the color. I remember one time, I wanted hot neon pink, but because of my black toenails, the color looked horrific and made my toes look dirty because of the dark coloration of my toenails. I’ve been to a podiatrist and he stated, your nails are naturally dark and there is nothing wrong with that. Also, my fingers nails are dark too, I’m always a little sub-conscious about my dark nails, cause I see friends and strangers staring at my nails like, why are her nails so dark? When I see a dark skin person with pretty finger and toenails, I envy them. Just wanted to share and vent.